Mini Berry Pavlovas are meringue-like cookies topped with berries sauce whipped cream, and fresh strawberries. It has egg whites, sugar, corn flour, and of course, berry sauce. It is more egg-ish. February is the â€œMONTH OF LOVE,â€� and everyone knows that. I know, I am not the first one telling you about this! ðŸ˜‰ For me, it demands desserts and more and more desserts. I am so in love with desserts these days, or maybe I am obsessed! ;-) You must be thinkingâ€”is it healthy to eat too much sweets??? I know eating too much sweet is not good for anyone. And thatâ€™s why I always try to keep my diet BALANCED, if I have too much of anything sweet. You remember this saying about HAPPINESSâ€”â€™You are truly happy when you have someone to love, something to do, and something to hope forâ€™! V Day is one of those few occasions for me, where this phrase fits EXQUISITELY. I have someone to LOVE, I will do something (many things ;-)) for HIM, and I will hope that would MAKE HIM HAPPY. Since I have got all these three thingsâ€”this is my humble duty to make this occasion special for the one I LOVE SO much!! Itâ€™s 9th of the month today, and only a few days left for V Day. So here I am sharing one more dessert recipe with you guys. A dessert that has been causing jaw-dropping at my home. This is none other than Mini Berry Pavlova. And when you will taste thisâ€”this would leave you and your loved one in an utter amazement. This Pavlova is so simple and looks absolutely gorgeous. So I can really say that itâ€™s A LOT simpler than it really looks. If you have guests coming over, DO make it for them. This pavlova which is innocently sitting on a plate, will blow everyone away with its magical charm as soon as the drizzle of raspberry sauce with whip cream tantalizingly lands on the surface of Pavlova. It actually has a flavor, an insanely good one. It has egg whites, sugar, corn flour, and of course, berry sauce. It is more egg-ish, which in my opinion = YUM YUM YUM! That also makes it go perfectly with the Berry sauce. 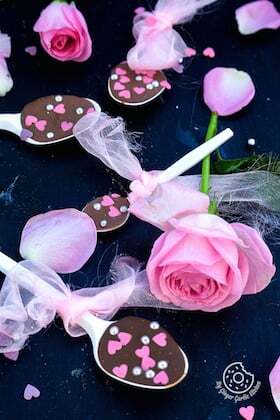 I baked them with a food color to give it a Valentine feel. Bake pavlova, and let them cool for 2 hours. Gently fold in raspberry sauce whipped cream. Mini Berry Pavlova for Valentine's Day! Mini Berry Pavlovas are meringue-like cookies topped with berries sauce whipped cream, and fresh strawberries. This is beautiful stiff, sweet pink dessert, which is hard to resist! The addition of cornflour and white vinegar is just awesome, and results is a wonderfully chewy marshmallow centre a crisp outer. Preheat it to 110Â°C. Line a large oven tray with baking paper, and place the oven tray in the lower third row. Whisk the egg whites in a large bowl using an electric mixer with a whisk attachment on medium speed until foamy. Add the salt, vinegar and cornflour and whisk on medium speed for about 1 minute. Add the sugar a spoonful at a time, whisking well after each addition, until all the sugar has dissolved and the mixture is very thick. This will take about 4-5 minutes. Add the vanilla extract, red food color and whisk to combine. Use a spatula to stir the meringue mixture to â€˜loosenâ€™ it slightly. This will get rid of any excess air in the mixture and give it a smoother, less â€˜foamyâ€™ texture. Spoon 6 large circles of mixture onto the lined tray and use the back of a metal spoon to make an intent in the center of each. Bake in preheated oven for 50-60 minutes, until the meringue is crisp and hard to touch, but not coloured. Turn off the oven, leave the door slightly open and cool completely in the oven for about 2 hours. Place raspberries and icing sugar in a small food processor, and process until pureed. Press the raspberry puree through a sieve and discard the seeds. Gently fold half the raspberry puree through the whipped cream. Fill each pavlova with the Raspberry Cream and then top with the Strawberries, and raspberries. Serve immediately with the remaining berry puree passed separately. Note: The unfilled pavlova shells can be kept in an airtight container in a cool place, for up to 1 day.